In St Mawgan, Meneage (many maps show Mawgan instead), near Helston, is a small brass memorial plaque to Hannibal Bassett, d. 1708, with one of the earliest western examples of a Latin square. It is on the left of the arch by the pulpit. I first heard of this from Chris Abbess. Chris Weeks has been kind enough to check out the site and has sent photos, though the plaque doesn't photograph well. Older sources site it at nearby Gunwallowe (or Cunwallow or Gunwallowe), but no such inscription could be found there in the mid 19C. Chris Weeks also sent pictures of Gunwallowe and the church is close to the cliff edge and it looks like there could once have been more churchyard on the other side of the church where the cliff has fallen away. In the church of St Mawgan is the brass plate with 'the Acrostic Brass Inscription', but it is not clearly associated with a grave and I wonder if it may have been moved from Gunwallowe when the grave was eroded by the sea. I reproduce Chris Weeks' copy of the text. Unfortunately it was too dark to photograph. The ss are old style long esses. The superscript th is actually over the numeral. The 9 is over the 8 in the year and there is no stroke. This is because it was before England adopted the Gregorian calendar and so the year began on 25 Mar and was a year behind the continent between 1 Jan and 25 Mar. Correspondence of the time commonly would show 1708/9 at this time, and I have used this form for typographic convenience, but with the 9 over the 8 as on the tomb. I don't know how the acrostic is physically laid out. 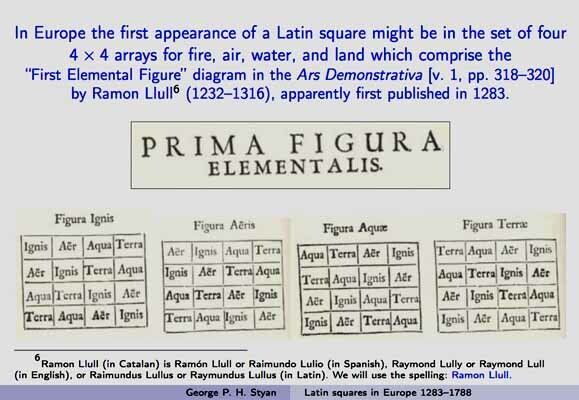 Though Latin Squares were known in the medieval Arabic world, this is the second oldest European example I know of (the oldest is in an Italian book of 1541; one author asserts Latin Squares were invented in 1710; Euler's paper, often cited as the beginning of the subject, doesn't appear until 1782).